This is a small highlight snipped from Dan John’s Goal Setting Process lecture. I’m always thinking about goals and goal setting, and about how I as a strength coach can make a difference. As I look back, one of the areas that was always the most difficult with young athletes is goal setting. You see, I had such clarity as a kid about what I wanted to do. There’s always a story behind my goals, and that’s really an important part of the goal-setting process. When you talk with someone about goals, the story is important—the history, the background. You’re dealing with a person who showed up with a goal, and it helps to see where it’s coming from. In goal setting, there’s a huge disconnect between what I hear, and what you’re saying. In the process of goal setting, there are two things. I call them (very fancy) Point A and Point B. Point A is where you are and Point B is your goal. With my elite athletes, they always know where they want to go—Olympic trials, Division I athlete, NFL, play three more years in the NFL or they want to keep their career going longer. That’s all laudable and are all wonderful things. But I work with people from a group of not even one percent of the population. The sheerest, thinnest wedge of the population I work with are people who know what they want. The problem with my athletes isn’t their goals—they always know where they want to go. They just don’t know where they are, which is why you’ll notice I talk about assessments in so much of my writing. I constantly assess my athletes. By showing an athlete where he is at Point A, we highlight much faster where he needs to go to get to Point B. This is the role of the assessment—figuring out where you are and then taking an honest look at Point B. Most elites know what they want. They just don’t know where they are, so that leap is just a little clouded. They know there’s another side over there. They just don’t know how far they have to jump. The bulk of the population knows exactly where they are. They know their Point A. The problem is, they don’t have a Point B; it’s more like they have a Point Z.
That’s fine, but it’s not reasonable. I would applaud somebody who’s going to go down that path. I would also argue that you need to be realistic about some things, but I support any and all goals. Assess, ask yourself what your goal is, and then learn to manage all options available to you. 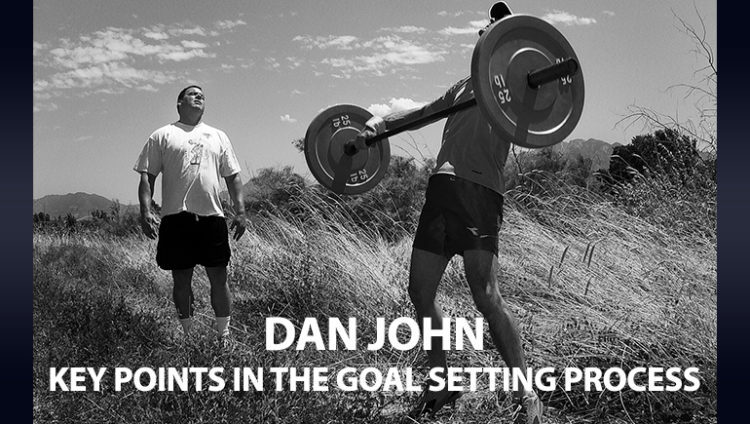 Here’s the link to Dan’s full Goal Setting lecture in case you’d like listen or read the rest of his talk.